Last year was one of action in Colombia. Not because of anything to do with the FARC or drug cartels. No, what Colombia saw last year was students uniting together for a common cause. If any of the Occupy protesters in the US want a lesson in creative, effective, nonviolent protest they need only to look to Colombia. 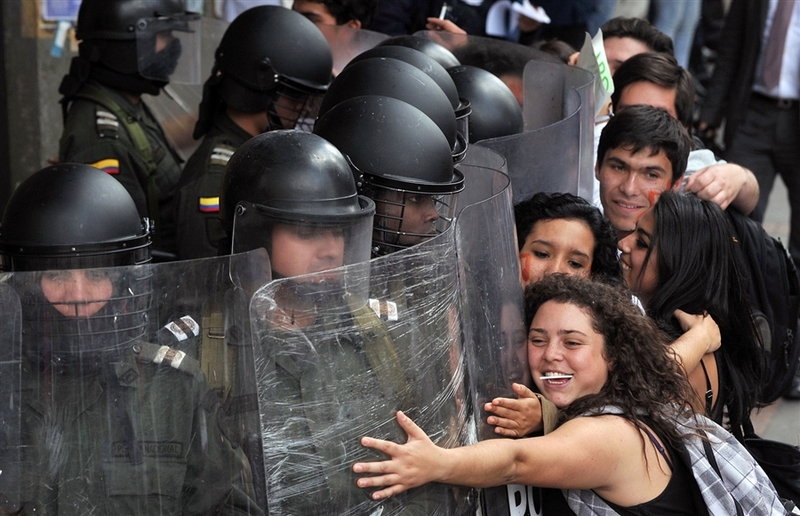 Colombia joined Chile in student protests when the first draft of the proposed reform of Law 30 was announced. 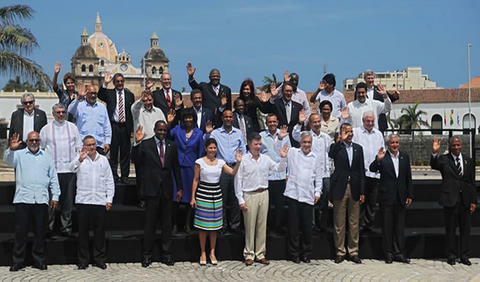 March of last year, President Juan Manuel Santos announced the need to reform higher education. He proposed a reform of the 1992 law, Law 30, a law which deals with higher education. The reform attempted to privatize education by encouraging private investment and by creating for-profit schools. The law would also increase the number of students in the classrooms which would mean the student to teacher ratio would increase and students would have less access to supplies. The students call this a ‘promotion of mediocrity’ by threatening the quality of education. Students also protest that the law reform would discourage education to develop skills for innovation and self-transformation. They say that they would be taught ‘to push the button, not to create the machine that made it’. Students are also concerned that subjects like humanities would be seen as ‘unprofitable’ and be dropped. The law would turn education into a product rather than a right. Justifiably, this proposed reform made students across the country irate and they took to the streets to voice that anger. On April 7, thousands of students and teachers took to the streets of Medellin, and even more nation wide, in opposition to the education reforms. They closed down several main streets in the city. As a result of the protests the Minister of Education, Maria Fernanda Campo, said she would open a national debate with students. 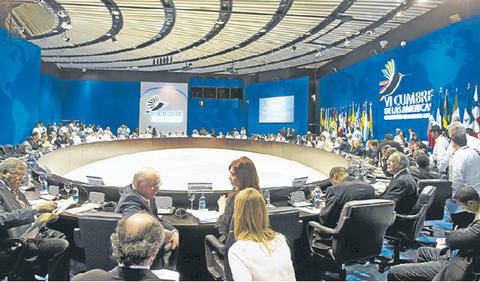 Later in August, after much public unrest regarding Law 30, President Santos promised to withdraw the for-profit section of the proposal of the reform. However, on September 7th thousands of students took to the streets in Bogotá to continue protesting Law 30. The students stated that the Law was still an attack on education. Following President Santos’ actions, on October 12th, there was a huge nationwide protest against Law 30. In Bogotá, 30,000 marched in the streets to Plaza Bolivar. Riot police clashed with protesters and used tear gas to attempt to disperse the protesters. In Medellin, 10,000 marched in the streets, nationally over 250,000 students took to the streets. Tragedy found the protests that day when a medical student in Cali fell down during the protest and activated a potato bomb which killed him. While a small minority of protesters resorted to violence and vandalism, the majority of the protesters across the country remained nonviolent and peaceful. The students gave the government the deadline of November 10th to completely withdraw the bill or they would block major streets in all participating cities. By the end of October students nationwide were on strike and not attending classes or school activities, instead they were on the streets trying to defend their right to education. They did so peacefully and creatively by having a hug-a-thon where they hugged police instead of confronting them. 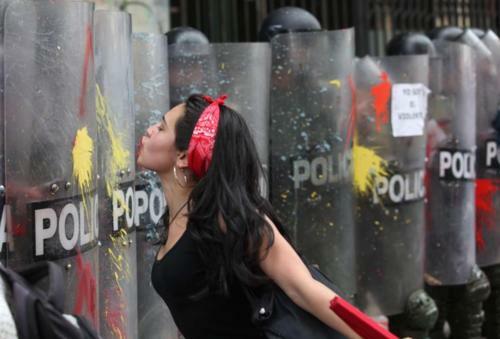 They had a besatón where they blocked major city streets by kissing each other. They organized flashmobs in malls and open canelazos, a national beverage used to gather people around the fire which incited public deliberation. There protests were peaceful, creative and persistent. On November 9th President Santos offered to withdraw the proposal of Law 30. Still it was no enough for protesters who were out on the streets in protest the following day. Bogotá saw over 20,000 students on the street protesting, despite the rain. The students said they would continue to protest until the law was actually withdrawn. Then in the middle of November, after students had been on strike for five weeks, the Congress voted to withdraw reform of Law 30. Students and activists hailed the vote as a victory. The National Alternative Education Board said in a statement, “there were three conditions – first, that this reform package was withdrawn; second, that the government showed a willingness to build a new reform package, and lastly that there were guarantees regarding finishing the semester. All this has been accepted by the government and so we will end the strike right now.” While students vowed to return to class, and ninety percent did, there will still some who did not view this as a victory. Students at University of Antioquia, for example, felt that there were more demands to be met. For those of us that study social movements or even those of us that have been following the failing ‘Occupy’ protests, Colombia’s students were victorious. Despite what the Colombian government may say the protesters had clear demands, they were persistent and despite a very small percentage they were peaceful and nonviolent. The government met their demands and the protesters ended their strike and returned to school. Yet, no social movements are ever completely over, there is always a next step. With this movement the protesters must make sure that the government does not try to implement the proposed reforms in another matter. Regrettably, I believe that Colombian students will have to take to the streets again in order to defend their education, but hopefully not in the near future. You don’t have to spend that much time with me before I start to bring up Latin American current affairs or make references to Latin American policies. It is no secret that it aggravates me that the news in the US is blasted with events in the Middle East but yet you truly have to dig to find out what his happening in Latin America, a region right next to us. That’s why it is no surprise to me that while, recently, it has been impossible to escape news on protests in Egypt and Libya; I have heard nothing about Chile’s student protests in the mainstream media here. No, I learned about it the way I normally have to learn about what is happening in Latin America by following the right people on Twitter and knowing where to dig on news sites. It saddens me because what is happening today in Chile is historical and something Latin America and the world could learn a lot from. Protests for education have been happening recently across Latin America, from Puerto Rico, to the Dominican Republic, to Mexico and to Colombia. However, the protests in Chile have gained the most attention as students, educators and Chilean citizens have been continuously protesting since May. The protests in Chile have brought together hundreds of thousands of Chileans across the country, the country has not seen protests this large-scale since the return of democracy in 1990. The protesters are fighting an unequal and segregated education system which has become more privatized recently. The protesters want public school to be run by Chile’s Education Ministry, instead of local governments. Public schools being run by local government increases the inequality between rich and poor districts. Chilean officials have focused primarily on access to education as opposed to quality and equality. The quality of public school education is extremely poor. Meanwhile, to attend a university, even if it is public, students have to pay enormous amounts of money. “They know that Chilean universities are the most expensive places to study, that advancing in higher education depends more on the university you leave than your own merits, that success isn’t guaranteed.”, said Bernardo Navarrete, a political analyst at the University of Santiago. Chile has the most complex financing system of education in the region. The education climate that people are experiencing in Chile is one where a parent has to decide which child to send to college. Higher education fees are normally higher than minimum wage. Only a small percent of Chilean youth, the wealthy percent, have access to quality schools and do not have to go into lifelong debt to receive it. Why is education so important? Education is the foundation to the society, with strong education comes strong leadership and positive change. To simply put it, better education will lead to a better country. The musical group Calle 13 has been publicly supporting the movement in Chile. The leader Rene Perez was quoted saying, “Education is fundamental. The easiest thing for a government is to have a public that is uneducated so that they won’t fight for their rights. There needs to be free and public education.” When a country has free, public, quality education there are more opportunities for the middle and lower classes to achieve a higher economic level, society gaps close. With more educated minds there are more people to contribute to the country, more minds to work on scientific, technological, and of course political problems. That is why education is so important, and why free, quality education needs to be achieved not only in Chile but across Latin America. The protests in Chile started as isolated boycotts by high school and university students. In early June protests started with anything from pillow fights in the streets to a huge flash mob of students dressed like zombies dancing to ‘Thriller’, to traditional peaceful rallies. Since the beginning of June hundreds of thousands of high-school and university students have been boycotting their classes as a means of protest. Several cacerolazos (a protest consisting of banging pots and pans) have been carried out. Protesters have also been occupying University of Chile’s campus, right next to the Presidential Palace. The protests have been large, although the Chilean government will try to convince you otherwise, and they have been consistently occurring for months. On August 1st, the government announced 21 policies and proposals for the development of education including writing into the constitution the right to quality education. However, on August 5th, protest leaders rejected the government’s proposal stating that they want a profound change to the system not just an improvement. A few days later there were mass protests across the country. The news focused mainly on the violence cause by few protesters who broke off from the crowd, but the majority of protesters remained peaceful. Mostly, it was the police whom acted aggressively with the protesters firing water cannons and tear gas into the crowd. Since the protests started two students have been killed by bullets and hundreds of student protesters have been arrested. Pinera’s government has scrambled to try to end the protests which have cause a nose dive in his popularity. On September 3rd, the President met with student leaders. Both sides discussed a twelve point petition submitted by the Confederation of Chilean Students that outlined demands for education reform. While the two sides agreed on some issues, like a constitutional guarantee to the right of quality education, they also disagreed on many central topics. Most recently, Chile’s Education Minister proposed working groups to find solutions to the conflict for education reform. Just this past Monday students handed over a counter-proposal with four guarantees they want from the government before participating in working groups. The guarantees were: to freeze two bills given to congress in August on education reform that were drafted with no student nor teacher input, to have TV and online coverage of the working groups, to end state funding for profit-based education institutions and, lastly, postponement of the end of the first academic semester, which could leave thousands of students without credit for a partially completed semester. The protesters have been quoted many times saying that they have no idea how this all will end, but they know they are making some sort of change. One unique aspect of these protests has been who has been at the head leading the masses, the face of the uprising, Camilla Vallejo. Vallejo is a 23-year-old student who serves as President of the University of Chile’s Student Union. Vallejo has her own police protection now, after receiving several death threats. Vallejo has always preached peace to the protesters reminding them that the fight is not against the police but a peaceful fight for education. When discussing Vallejo I can’t help but compare and contrast her with Mexico’s Javier Sicilia (who you can read about in my What the Heck is going on in Mexico? blog) They both are the faces of movements for hope of a better future for each of their respected countries. They both emphasize maintaining peace in their movements and protests and both won’t settle or make half way deals with their governments. However, unlike Sicilia, Vallejo is not an old man in a cowboy hat and a multi-pocketed vest, no Vallejo’s youth and beauty has captivated the nation and the world. Vallejo is very aware of this and uses it to her advantage. She was quoted saying, “You have to recognize that beauty can be a hook. It can be a compliment, they come to listen to me because of my appearance, but then I explain the ideas. A movement as historical as this cannot be summarized in such superficial terms.” And unlike Sicilia, Vallejo is still very young, and it is because of this that Chile is buzzing with hopes of a political future for her. There is no way of telling what the end result of this movement in Chile will be. But this movement has already accomplished so much I can only imagine that this movement is headed towards success. Perhaps Chile will be a model for movements for education reform across Latin America, a catalyst for movements in the region. They are already happening in Latin America, but from what I have seen they have not reached the level of Chile. I have not followed many of the other education movements closely, except for the Dominican Republic’s 4% movement. Last year, there were calls for the Dominican government to increase the amount of the GDP spent on education to 4%. Two days last year the entire country wore yellow in support of the movement. But there needs to be more, the Dominican needs to follow Chile’s model it’s laid down. The Dominicans, and other citizens of Latin American countries, need to hit the streets in peaceful protest and continue to protest until their demands are met. Today Chile is seen as the beginning of a huge shift in Latin America. Hopefully one day, Chile, the Dominican Republic, and all of Latin America will have education that is accessible to all, free for all and of high quality for all.